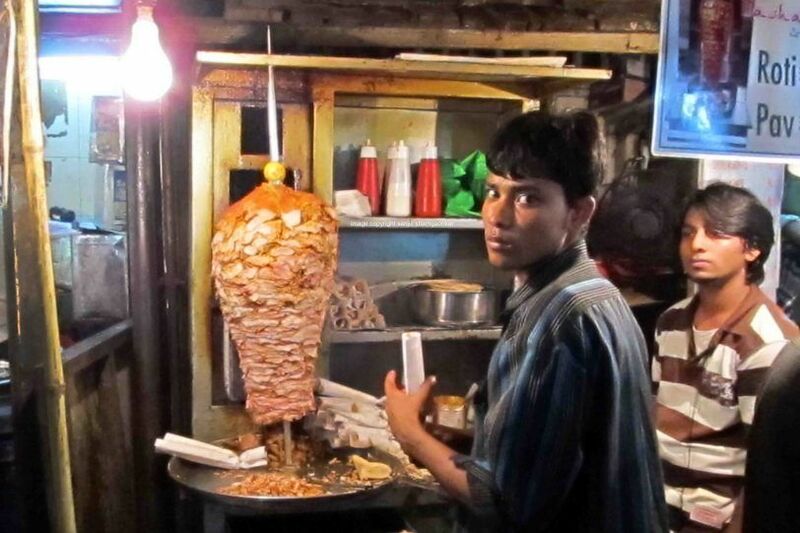 If there are two things Mumbai is most famous for, they’re Bollywood and street food. Across the city, you will find hawkers setting up food stalls at street corners, on the pavements, or near schools and offices selling hot portions of snacks and meals. Mumbai street food is unbelievable, overwhelming and doubly satisfying. While you could, at one time, only get snacks, today hawkers have improvised and are now serving a variety of food that not only include snacks, but main courses, ice creams, and a few international cuisines. In this article, we take a look at the 17 varieties of Mumbai street food that are unbeatable. The Vada Pav is the holy grail of all the famous street food in Mumbai. Although it is available at most local restaurants in Mumbai, the best experience of eating a vada pav is at a street food cart. The vada is basically a potato patty, deep fried with gram flour (besan). It is served with a spicy-sweet chutney (sauce) and bread. Rs. 10 should be enough to get you a nice sumptuous vada pav, but if you go to one of those fancy restaurants, it could cost you more. Where to get it: Ashok Vada Pav in Dadar or Gajanan Vada Pav in Thane are great options. The grilled corn or Bhutta is a popular beach snack. When winter arrives, at every beach in Mumbai, you will bhuttawallas selling corn grilled on the chulha and served with lime and chaat masala. Known differently in other parts in India, in Mumbai the snack is called Paani Puri. A favourite chaat item, Paani Puri is served by the plate. The stuffing for the puri consist of chickpeas, sprouts or potatoes and spices. You get six puris per plate and have the option to choose either sweet or pungent sauces. After you’re done eating your plate of paani puri, it is customary to ask for aplain puri that is served without the chutney. Yet another chaat item that is popular in Mumbai, Sev Batata Puri is basically a mixture of onions, potatoes, tomatoes, and chillies served on fried flat puris topped with sweet, spicy, and mint sauces. Just like Paani Puri, Sev Batata Puri is served by the plate. It is most commonly eaten as an evening snack with tea. For a unique taste, try the Dahi (curd) Sev Batata Puri that comes with a coating of curd over the sauces. A plate of bhel puri should not cost you more than Rs. 60 at a street food stall. Where to get it: Juhu and Chowpatty Beaches, Aditi Snacks, near Mithibai college, Marine Drive. A newcomer to Mumbai’s buzzing street food scene, Chinese Bhel came about by combining two different cuisines, Indian and Chinese. Popular with children, this dish can be found at stalls outside schools and playgrounds. Chinese Bhel is nothing but fried noodles served with schezwan sauce, onions and a few cut chilies. Bhel as it is popularly called is a famous chaat food found at street stalls in Mumbai. Bhel is made using puffed rice and minced onion, potato, and chilli, topped with coriander leaves. To add spice, spicy and minty sauces are added to the bhel. The dish is served with a puri and should not cost you more than Rs. 50 a plate. Pav Bhaji originated in Maharashtra, no wonder then that is has gained immense popularity with the people of Mumbai. The dish is commonly served with bread smeared with butter, onions on the side and a dollop of butter on the pav bhaji. Apart from the regular version, which is made purely of tomatoes and potatoes, you get another version called khada pav bhaji that is a mash of cauliflower and other vegetables. In Mumbai, you get a different version of a sandwich when compared to what you get abroad. 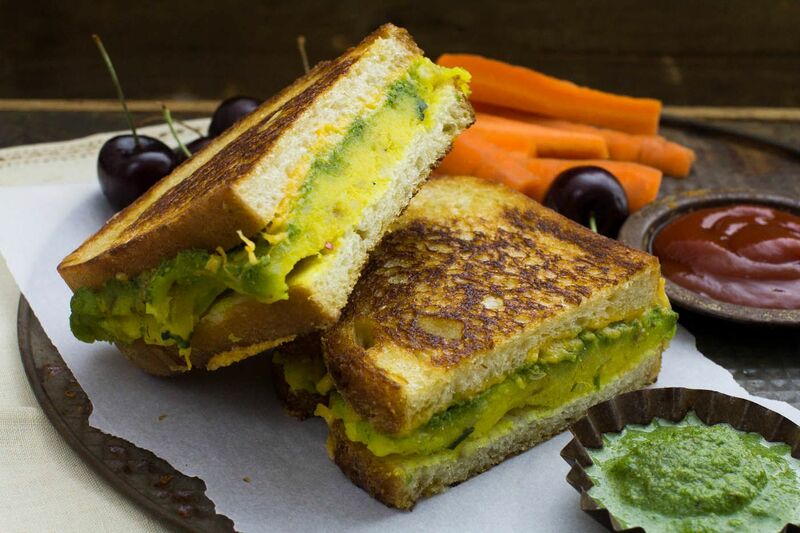 Toasted on a grill with a potato filling and green,mint chutney, the Mumbai sandwich is a popular snack on Mumbai’s street food scene. At most places, you will find this being had by office goers either on their way to work or back home and college going students. Apart from the typical Mumbai sandwich, you also get other varieties with cheese, paneer and even with schezwan sauce. You might think that dosa is only popular in the South of India, you’re wrong. In Mumbai, you have plenty of stalls serving dosas, idli, and medu vada with hot sambar and yummy coconut chutney. 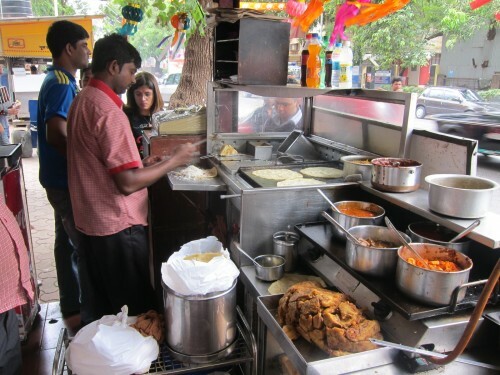 Popular as a breakfast item, you will find dosa stalls all over corporate parks and markets. The dosas are made fresh and crisp. You can go authentic, with the sada dosa, or spice it up with a potato filling, cheese or even chocolate! This delicious and spicy gravy, topped with chivda is a heartwarming pleasure for breakfast. Misal Pav is served at small carts across the city, particularly those areas with a strong Maharashtrian population, such as Dadar and Lalbaug. A unique item, this features a gravy of white peas served with an aloo tikki, topped with coriander and a few chutneys. This cheap Mumbai street food is filling and, therefore, a good lunch option if you ever see a vendor around. How do you find a ragda pattice vendor? Well, you just can’t miss the arrangement of the food, as you can see in the picture. The Frankie is one of the most famous rolls served on the streets of Mumbai. The filling for every Frankie Roll is made by the same company (Tibbs). The rolls are available in both vegetarian and non-vegetarian options. A peculiarity among Frankie stalls across Mumbai is that almost all of them will have their carts painted in a red shade. A Frankie will cost you anything between Rs. 30 to Rs. 60, depending on where you eat it and what the filling is. Another new entrant to the street food scene in Mumbai, Momos are now a favourite. You will find momo carts across the city, with vendors serving both vegetarian and non-vegetarian delights. Healthier than many of the other options in the regular steamed version, you’ll also find them fried if you’re feeling like treating yourself. When it comes to non-vegetarian food, there is no other dish that is more popular than kebabs in Mumbai. Whether it is at a restaurant or a local street kebab corner, kebabs are the hot favourite among the non-veg eating folks of Mumbai. In places in Mohammad Ali Road, Colaba, Jogeshwari West, and Bandra Station, you will have plenty of varieties to choose from when it comes to kebabs. Available in chicken, mutton, and buff, kebabs are normally served with a spicy mint chutney and onions. 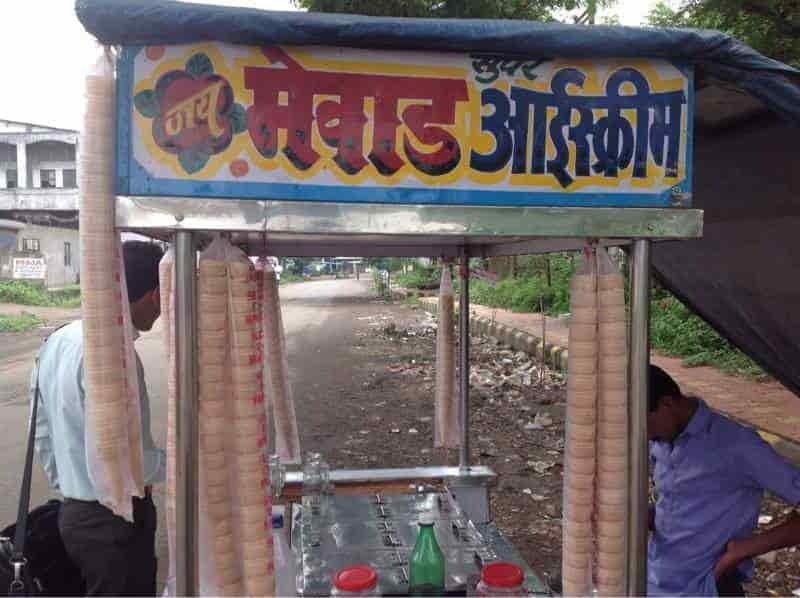 You will find Mewad ice cream carts parked at crowded corners of every suburb in Mumbai. Available in a variety of flavors, the Mewad ice cream is best eaten in a cone. Apart from ice cream, Mewad stalls also serve falooda and something that’s called fruit salad which is basically the custard with fruits in it. While food has always been a key part of Mumbai’s food scene, juices closely follow suit. In Mumbai, you will find plenty of juice stalls all over the place. Famous ones are the Amar Juice Centre in Vile Parle, the Haji Ali Juice Centre in Worli and Badshah Falooda opposite Crawford Market. You will also find quite a few juice stalls at the local railways stations in Mumbai. Sweet lime and lemon are a popular juice among the people of Mumbai. Mumbai is a city that loves to eat and this list is proof. The next time you are in the city, we suggest you head out to explore the local street food scene and try your hand this famous street food in Mumbai. We are pretty sure you will enjoy them to the fullest. Would you like to add to this list? Let us know in the comments.